Making and decorating gingerbread on Christmas day has been a family tradition since the children were little. After all the gifts are opened, the meal eaten and the dishes done, the kids and I have made gingerbread houses, villages, mangers, and cookies and have decorated them with royal icing and lots of candy. We used to keep them on display until New Year’s Eve at which time we ate our creations. 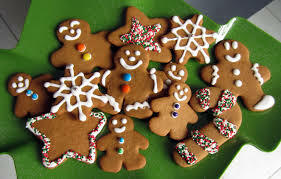 During the last couple of years, my youngest daughter and I have carried on the tradition, simplifying the activity by making and decorating gingerbread cookies. As you can imagine, at the end of Christmas day each year, I have often found myself wondering if the additional activity – with its preparations and mess to clean up – is worth the effort. It can be exhausting to go from dawn to dusk trying to make Christmas a special day for everyone in the family. But yesterday afternoon, as I sat at the kitchen table icing and placing m&ms on my gingerbread Christmas tree, I looked up took in the scene of my daughter taking great pains to make her snowman just right. As she dusted her cookie with white sanding sugar making him glisten, I smiled and enjoyed the moment. My daughter, the youngest of our three, has been away at college since August and is home for Christmas vacation. As I sat there watching her decorate her cookie with the precision that she applies to everything, my mind traveled like Scrooge, through all the scenes of Christmases passed. With my mind’s eye, I could see her sister and brother beside her working on their houses, covering them with Twizzlers and Wheat Chex, sprinkles all over the table and rolling onto the floor. I realized in that moment, that it was all worth it. The joy of simple things makes life full and meaningful. As homeschooling parents, we have so much time with our children. So many opportunities to stop and treasure moments in our hearts. The additional blessing is that these moments will be what our children also treasure in their hearts. Take time today to savor the joys of simple things with your family. Sitting at the kitchen table laughing at the jokes you’ve heard a million times, re-reading stories that you’ve read to them since they were little, watching home movies, making gingerbread cookies, whatever the activity, there are joys that make ordinary situations meaningful and memorable. Look for and experience the joys today ~ I know that I will. Next Back after an absence… Happy New Year! Thank you for these well said words. I’m grateful for your insight.